Oct. 4, 2013 7:00 p.m. 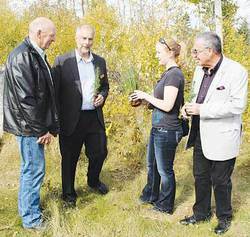 The Edmonton and Area Land Trust officially opened the 104 acre property with the planting of seedling trees by County Councilor Terry Van de Kraats, Augustana University Dean, Dr. Rick Johnson and City of Wetaskiwin Mayor Bill Elliot. EALT recently received $5,000 and a Canon PowerShot camera, from Canon’s Take Root Program, presented by Evergreen, to restore important wildlife habitat at Pipestone Creek and educate the surrounding community. Pipestone Creek Restoration and Education will create important habitat for wildlife and raise awareness about conservation in the community.